Diversity in metabolite polarity and electrospray ionization efficiency challenge the development of a single method. Chemical derivatization can significantly improve chromatographic retention time and MS response. 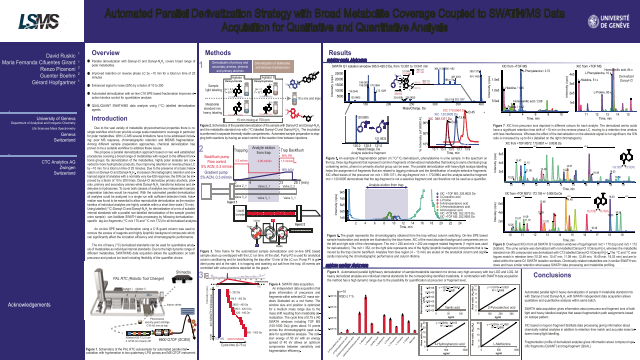 We propose a workflow including an automated fast parallel derivatization of amines, phenols, aldehydes, alcohols and ketones followed by QUAL/QUANT SWATH/MS analysis for broad metabolite coverage. Dansyl-chloride (DanCl), dansyl-hydrazine (Dan-N2H3) and their 13C label analogs were used as derivatization agents. Samples (49 analyte mix and urine) were derivatized with 12C reagents while standards were derivatized with 13C labeled regents using PAL RTC autosampler (CTC Analytics). The two fractions were mixed and injected onto a column-swtiching LC system. MS acquisition was performed on a TTOF6600 (Sciex) using SWATH acquisition. Polar metabolites are converted to more hydrophobic products (DanCl and Dan-N2H3 derivatives), enabling them to be separated on reverse phase liquid chromatography. The presence of a basic p-amino group on both reagents increase the electrospray response factor by a factor of 10 to 200. Primary alcohols, phenols, primary and secondary amines are derivatized with DanCl and Dan-N2H3 transforms ketones and aldehydes to hydrazones. The automated parallel derivatization enables reproducible derivatizations in a single workflow including light labeling of sample and heavy 13C labeling of metabolite mix in 15 minutes during the LC analysis of the previous sample. Collision induced dissociation generates fragments specific for the analyte, and for the light and heavy derivatized analytes and for tags (XIC m/z=171 and m/z=173). LC-SWATH/MS which collects all precursors and all fragments allowed the screening and the relative and absolute quantification (n=45) of metabolites in urine.